Although Social Security remains a crucial benefit for millions of seniors, the program was designed to serve an American society of 75 year ago. Much has changed since its inception: Americans are living longer, women's participation in the labour force has significantly increased, and with a rise in the divorce rate, household composition has changed. In addition, the labour force is growing more slowly and the nature of work and compensation has altered in ways that affect workers' ability to save for retirement. As a result, under its current design, Social Security may not be as effective as it could be in addressing the needs of our society both now and in the future. 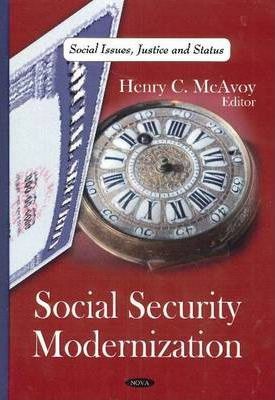 This book explores the modernisation of the Social Security program to reflect America's evolving demographics which is vital to ensuring that benefits are adequate and equitable for generations to come. Preface; Social Security Modernization: Options to Address Solvency & Benefit Adequacy; Social Security Reform: Legal Analysis of Social Security Benefit Entitlement Issues; Opening Statement of Senator Herb Kohl, before the Special Committee on Aging, Hearing on "Social Security: Keeping the Promise in the 21st Century"; Testimony of U.S. Senator Mel Martinez, (R-FL), before the Special Committee on Aging, Hearing on "Social Security: Keeping the Promise in the 21st Century"; Testimony of John S. Irons, Ph.D., Research & Policy Director, Economic Policy Institute, before the Special Committee on Aging, Hearing on "Social Security: Keeping the Promise in the 21st Century"; Statement of Andrew G. Biggs, Ph.D., Resident Scholar, American Enterprise Institute, before the Special Committee on Aging, Hearing on "Social Security: Keeping the Promise in the 21st Century"; Statement of Kenneth S. Apfel, Professor of the Practice, Maryland School of Public Policy, The University of Maryland, before the Special Committee on Aging, Hearing on "Social Security: Keeping the Promise in the 21st Century"; Testimony of Joan Entmacher, Vice President for Family Economic Security, National Women's Law Center, before the Special Committee on Aging, Hearing on "Social Security: Keeping the Promise in the 21st Century"; Statement of Melissa M. Favreault, Senior Research Associate, The Urban Institute, before the Special Committee on Aging, Hearing on "Revitalizing Social Security: Effectively Targeting Benefit Enhancements for Low Lifetime Earners & the Oldest Old"; Index.